School has started for us and I officially have a first grader. OMG. I cannot believe it. Time is flying by and it really should slow down. Anyway, I’m always trying to come up with new ideas to keep my kiddo interested in her lunches. 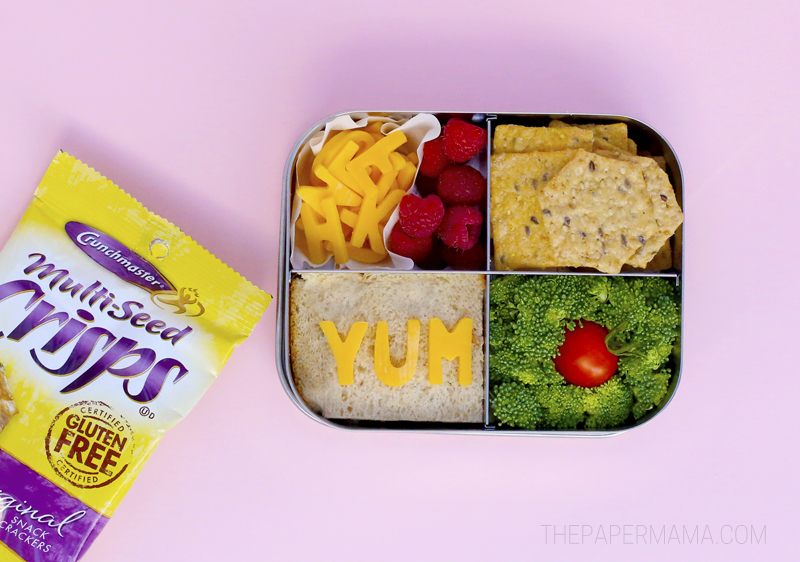 The other day I created this fun Alphabet Bento Lunch Idea. It definitely encourages her to play with her food, but I’m okay with that. I think it’s okay to sometimes have fun with your food. I found these awesome small alphabet cookie cutters at the store and I knew they would be perfect for cutting shapes out for my daughter’s lunch. What’s in her lunch? A small cheese sandwich (she always wants a cheese sandwich), cheese alphabet (cut from slices of cheese), fresh raspberries from the garden (they are still growing), broccoli and a tomato, and some yummy blend of Crunchmaster® Original Multi-Grain Crisps and White Cheddar Multi-Grain crackers (she likes variety in her snacks). These Crunchmaster® crackers are made from brown rice and were new to us. Turns out my kiddo loves them! After school my daughter reported that she really enjoyed this lunch and wants it again! She had fun spelling words on her Crunchmaster crackers and her friends helped her come up with things to spell. She spelled “cool”, “school”, “yummy”, and “fart”. Yup. She spelled fart, she is a 6-year-old. Ha! What I really love about this bento lunch is it’s not completely over the top. I do enjoy looking at those amazing lunches online, but I just don’t have that kind of time. 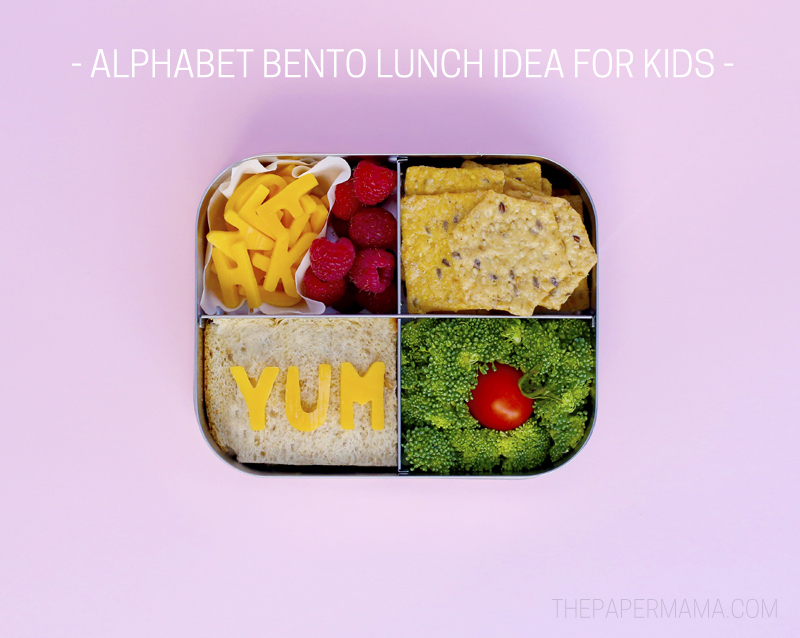 My Alphabet Bento Lunch Idea is easy to create and not too crazy to put together on a busy school night. What do you do to make lunches more fun for your kids? What combo would you come up with using Crunchmaster crackers? If you share your kid lunches online, I want to see! You can tag me on Instagram (my user name is @thepapermama). This post was sponsored by Crunchmaster® and I was paid to share this fun lunch idea with you! A full-flavored snack made with brown rice and wholesome ingredients that is oven-baked, kosher, low in sugar and naturally gluten free. These thin and crispy snacks are baked using an authentic Japanese “Usuyaki” process to create an incredible crunch.